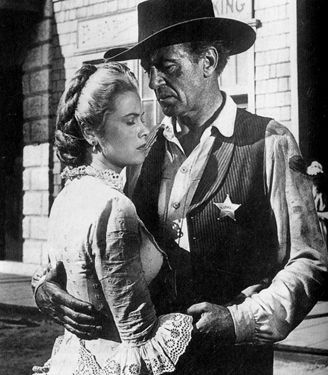 Grace Kelly and Gary Cooper in High Noon. On the AFI's list of "America's 100 Greatest Movies," High Noon (1952) earned the highest ranking (#33) of any Western. However, High Noon's status among Western aficionados is far from unanimous. One of the movie's most famous critics is American film director Howard Hawks. He created Rio Bravo (1959) as a reaction against High Noon. He said, "I didn't think a good sheriff was going to go running around town like a chicken with his head off asking for help" (from an interview with Howard Hawks in Hawks on Hawks by Joseph McBride). So Hawks created a Western where the sheriff refuses help from town citizens. He only relies upon people like himself who are outsiders. Hawks established an us-vs.-them dichotomy that considers lawmen as necessarily separate from the society they protect. In High Noon, however, Carl Foreman's script breaks one of the rules of Hawks' world by incorporating its hero into society. When we first see Will Kane (Gary Cooper), he's getting married. He has decided to give up his gun and his tin star for life tending a store on the prairie with his Quaker wife (Grace Kelly). Significantly, he can't simply settle down in the same town he served. He must leave it. The town's previous marshal, played by Lon Chaney, Jr., has settled down in town, but his marginal status is underscored by the presence of an Indian wife. The years he served are represented by the arthritis that makes his hands almost useless. But moreover, his attitude has hardened into cynicism: "It's a great life. You risk your skin catching killers and juries turn 'em loose so they can come back and shoot at ya again. If you're honest, you're poor your whole life. And in the end, you wind up dying all alone on some dirty street. For what? For nothing. For a tin star." This conflict between personal responsibility and the needs of the community is where High Noon excels. It's what makes it a great movie--contrary to what Howard Hawks would have us believe. Unlike a Hawks hero, Will Kane's pure status as an outsider has been tainted--even feminized--by his relationship to society (in general) and to his wife (specifically). We can see the concern on his face when he hears that Frank Miller, a man he sent to jail for murder, has been pardoned by the politicians up north. He's afraid of what might happen when Frank Miller arrives on the noon train and joins with three revenge-happy buddies. We see the perspiration beading on his brow. We see his frustration when he fails to find men to deputize. Will Kane is definitely not in control of the situation. Possibly the movie's greatest virtue is this sense of Will Kane's weakened stature. Many actors turned down the role, including Gregory Peck, Marlon Brando, and Montgomery Clift, before it was offered to Gary Cooper. And it's not difficult to see why these actors refused: Will Kane is not a typical Western hero. As one character tells us, he has "got soft"--which not coincidentally has happened during the past year when he was courtin' his wife. Before then, when the town was wilder, he had six deputies. They cleaned up the town and made it fit for women and kids. But now, exactly because of his closeness to civilization, the town has lost some faith in his ability to meet the challenge of Frank Miller. Time after time, people tell him to leave town, but he can't do it. Quite accurately, he says this is the best time to make a stand: "They'll just come after us, four of them, and we'd be all alone on the prairie." He knows he can't run away. Therefore, he can't listen to his wife's pleading. She urges him to not confront his problems, and she practically throws a tantrum when she doesn't get her way. "Don't try to be a hero," says Amy. "I'm not trying to be a hero. If you think I like this, you're crazy," says Kane. However, for Will Kane to stand against Frank Miller, the townsfolk must come to his aid. They must volunteer as deputies. But because they interpret the threat to Kane as personal, the townsfolk hesitate. While it was okay for Kane to put his life on the line for the benefit of the community, the community refuses to return the favor. This is an arguably cynical conceit of Foreman's script--that a town would desert the man who made civilized life possible in the community. But the movie takes pains to suggest a multiplicity of reasons for why people won't join Kane against Frank Miller. Deputy Harvey Pell (Lloyd Bridges) wanted to be appointed as the new marshal. He won't help unless Kane agrees to use his weight to secure him the job. Sam (Henry Morgan) is a businessman who simply fears being shot. Jonas Henderson (Thomas Mitchell) is one of the town elders. He argues that it's a matter of economics: if people hear about a shootout, they won't bring business to town, so he urges Kane to flee: "It's better for us." Herb (James Millican) is willing to help but when no one else comes through, he drops out also: "I got a wife and kids. What about my kids?" he says. The town's darker side is represented by those men who admire Frank Miller. The hotel clerk speaks for them when he says, "This place was always busy when Frank Miller was around. I'm not the only one. There's plenty of people around here think he [Will Kane] has got a comeuppance coming." Likewise, when Frank Miller's brother enters the town bar, he's treated like a celebrity. He gets patted on the back: "Been a long time." The barkeep says, "There'll be a hot time in the town tonight." Later, Kane enters the bar to ask for volunteers and finds no takers, only sneers. This failure isn't particularly surprising, for the men in the bar are (at best) only marginal members of society. More damning are the refusals of the men in the Sunday service. When Kane enters the church to ask for help, several men step forward to offer their assistance. But the discussion that ensues suggests it's best for the community if they don't help Will Kane. Without any supporters, Kane walks out of the church alone. Later, one of the movie's most effective camera shots comes when the men and women sit in the church pews--afraid to leave until after the noon train has arrived and the gun shots have subsided. Their heads hang low as the clock inexorably clicks to noon. Will Kane is definitely not Howard Hawks' idea of a hero, but that's not to say Western characters like Will Kane shouldn't exist or that they're less viable fictional constructs. He wouldn't have fit into Hawks' world, yes. But Foreman and Zinnemann suggest a very different vision of the West. They offer a West where society uncomfortably considers their responsibility to the men we call heroes--while the heroes attempt to become part of the communities they have served. John Ford would consider this territory in The Searchers and The Man Who Shot Liberty Valance and show us heroes who could never become integrated within civilization. In The Searchers, the hero is framed outside of the family he has restored, and in The Man Who Shot Liberty Valance, the hero dies alone--with no family. Foreman and Zinnemann explicitly place their hero on the verge of entering society and then consider the consequences. The face of Gary Cooper becomes the ideal vehicle for carrying this complex story. He isn't the towering monument suggested by John Wayne. He's more fallible--and thus more human. Will Kane's uncertainty and anxiety could never have been attempted by Wayne (who like Hawks probably despised the character of Will Kane). However, with this alternate vision of the Western, High Noon achieves complexities that typically stayed beyond the reach of conventional Westerns.